After picking you from the airport or your hotel in Bucharest, we start our journey to Transylvania heading to the medieval city of Sibiu – the European Capital of Culture in 2007. During our 4 hour drive we'll have a stop at Cozia Monastery - founded in 1387, being the only Byzantine style building preserved in Romania. 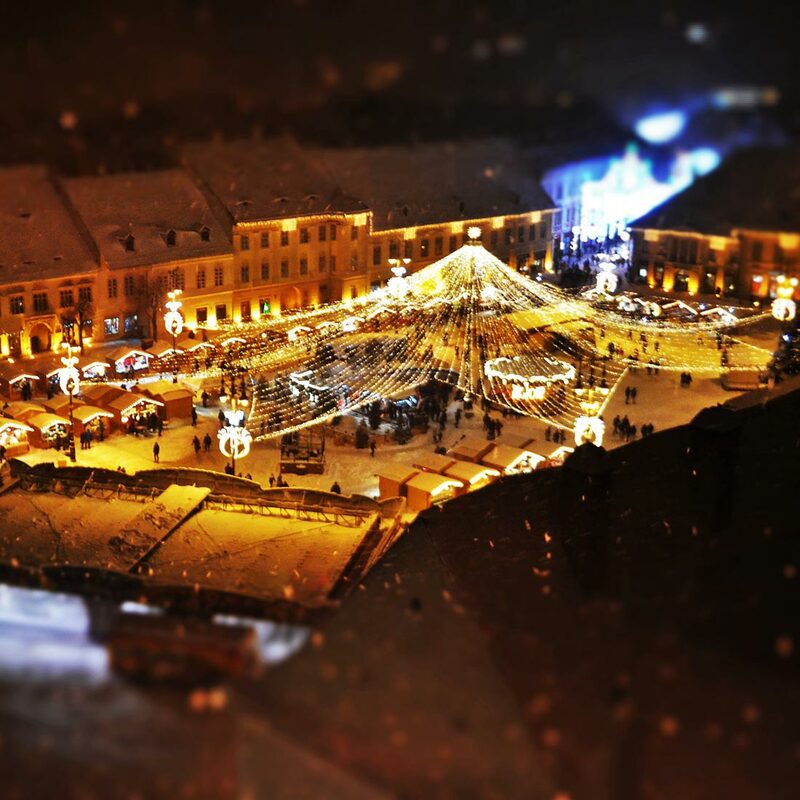 Hermannstadt - Sibiu's name in German - is probably the most beautiful city of Romania no matter the season. Its ancient buildings but still in great shape will take us back in time with centuries. After a pleasant walk in the historical city center including: the Small Square, the Liars’ Bridge, the Council Tower, the Lutheran and Catholic Churches, the Orthodox Cathedral, we shall stop in the Large Square where one of the most beautiful Christmas market in Romania will welcome us with its unique charm. Sibiu's Christmas market was the first real one organized in Romania, inspired in 2007 from Vienna's Christmas markets to become in 2012 part of the top 15 "Most beautiful Christmas markets in Europe"
Today it is time to go deeper in Transylvania. We have the option to continue our trip to another medieval city, Sighisoara - with its charming citadel included in UNESCO. We shall have a relaxing walk in the citadel and discover the full story about it. We shall go up in the Tower Clock for the beautiful panoramic view of the city, then climb the Students' Stairs to reach the Church on the Hill from the 15th Century. But we shall also make sure not to miss the house where Vlad the Impaler - aka Dracula - was supposed to have be born. The other option (only one of the two is possible even though both are certainly very attractive) is to visit the interesting and unique Ice Hotel on top of the most famous road in the mountains in Romania, the Transfagarasan road. For that, we need to take the cable car and reach the top at nearly 2034 meters altitude where the Ice Hotel is present now in every winter. Hopefully you will not request us to spend the night in one of the Hotel's icy rooms since we need to continue our trip to the next Christmas market, in the medieval city of Brasov. In Brasov, first we shall visit the Black Church built in the 14th centrury and have a relaxing walk in the Council Square. Here is where the Christmas market will welcome us as well with special local handicrafts and gifts. The traditional sausages or cakes but also some hot wine will get us into the Christmas atmosphere. We shall dedicate today to the two most famous castles in Romania, Bran - aka Dracula's and Peles. First on the list will be the mysterious Bran Castle, where you shall find out the real story about Dracula and how he became the most famous character from Romania all over. Later we stop in Sinaia, "the Pearl of the Carpathians" where one of the most beautiful castles in Europe is awaiting for us to visit. Peles Castle used to be the summer royal residence starting with 1883 for the first kind of Romania, Carol I and continued to be a landmark in royal's history until 1947 when the royal family was expelled by the communists. Nowadays the castle is opened to the public from Wednesday - Sunday (winter program). In the evening we shall arrive in Bucharest, where the spectacle of Christmas lights will amaize you with so many nice decorated streets. In recent years, Bucharest's Christmas market has started to compete with the ones in Sibiu and Brasov, but it is you who is going to tell which one is the nicest this year. Depending on the time of your flight, we can visit more some landmarks of Bucharest then transfer you to the airport for your flight back home. INSURANCE POLICY - OMNIASIG VIENNA INSURANCE GROUP S.A.